How’s that old saying go about it being difficult to beat a division rival four straight in a season, especially when they’re 9-41? 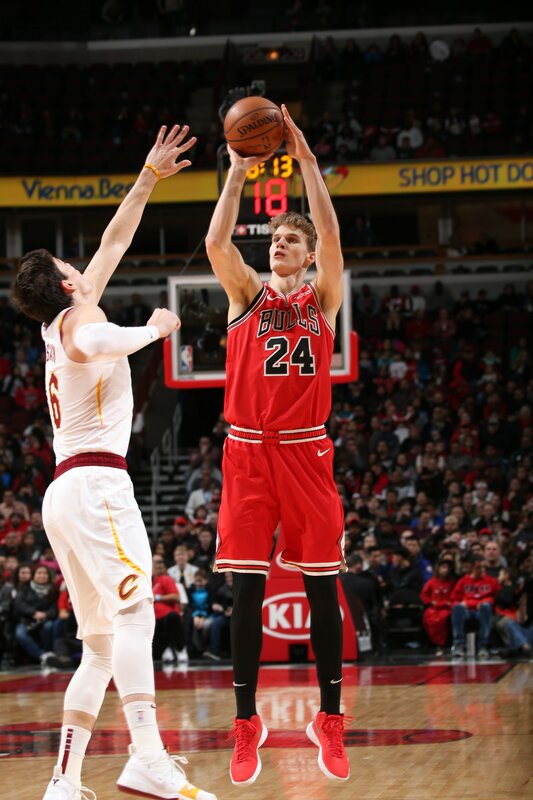 The Bulls Sunday failed to sweep the Cleveland Cavaliers for the season, losing for the first time 104-101 when Alec Burks caught a Robin Lopez block and pushed in a 10 footer with 17 seconds left in the game. Kris Dunn then failed with a driving layup, and after an intentional foul, Zach LaVine got a good look on a 25 footer to tie. But at least for the second straight game, the Bulls had a shot in the last seconds after LaVine missed a three to tie Friday against the Clippers with 27 seconds left. 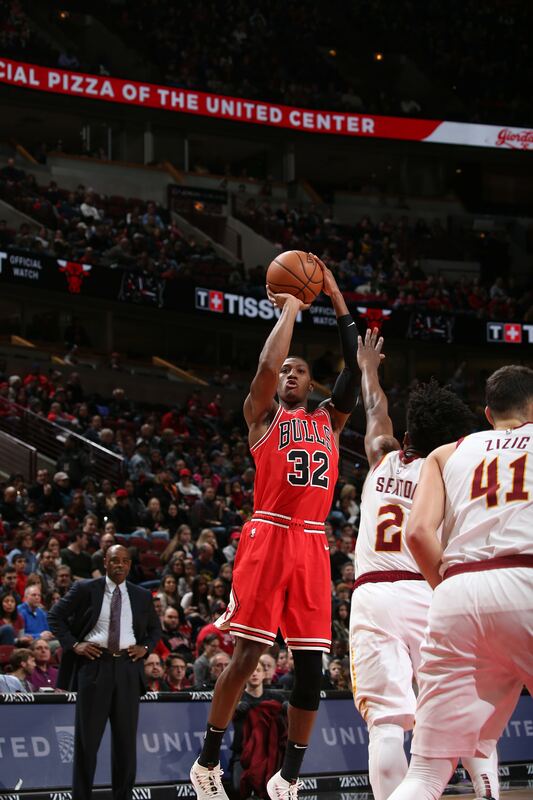 It’s progress of a sort as the Bulls dropped to 11-39 with their 13th loss in the last 14. Cleveland is 10-41 in what’s become a race to the draft lottery as well. The Cavaliers benched their leading scorer for the game, Jordan Clarkson, with 5:42 left after he’d made all his fourth quarter attempts. These are ambivalent times for those out of the playoff race. But, again, seeing it at least half full. Obviously, the Bulls have had plenty of opportunities this season to say things like that as they lurch toward the end of a disappointing season. It’s too late to change much of substance with two more starters out, rookies Wendell Carter Jr. for the season and Hutchison until after the All-Star break following his best game of the season. The Bulls aren’t getting many breaks this season other than bones. A play to win the game in the last 17 seconds? The Bulls would sign up for that, especially this season. But who gets the shot? Mostly it’s been LaVine, who did miss that equalizer Friday. He’s the best among the (hope they will become the) Big Three at creating a last second shot. But he was six for 16 at that point. Credit LaVine for extending himself the way he was on the boards. Markkanen was the lead scorer, but just six of 15 and not particularly adept at isolation plays. The problem, and it was that way much of the game again, is the Bulls movement on offense has been lacking. Too often Dunn holds the ball too long, resulting in time for just a quick screen and one pass and shot. So Markkanen wasn’t getting many late opportunities. He didn’t get a shot in the last 5:42. So again, as has often been discussed this season, Markkanen needs to be a little more selfish, and the offense needs to be a little more creative to get him opportunities in the open court and with movement. Markkanen’s a seven footer who is as quick as many guards. There aren’t a lot of matchups for that. Perhaps Selden should have been the choice since he was the only Bull not to miss a shot in the fourth quarter and put the Bulls ahead 101-100 with a three on a nice Dunn pass with 1:07 left. Unable to get lucky after that Lopez block, the Bulls opted to go full court after a timeout with 17 seconds. Dunn dribbled out of the backcourt toward the right side with Markkanen in the right corner and LaVine in the left corner. Selden was setting a screen for LaVine and Markkanen began to move toward the ball. Dunn didn’t seem to have it in his mind to pass. He was being defended by forward Rodney Hood, who isn’t quick. Hood angled toward Markkanen. There was still 12 seconds left and Markkanen was just making his move out of the corner when Dunn did a crossover drive and went left toward the middle of the lane. He went up and got a little bump from Hood. Bulls players seemed surprised Dunn was taking the shot so quickly as no one was even near the lane. Dunn switched hands and went up off balance with his left hand, a somewhat awkward shot with his back facing the basket as he spun. The ball hit high off the backboard above the rim and came down to the Cavs with 9.2 seconds left. There was no foul call. Cleveland went to the free throw line with 4.7 seconds left and made both as the Bulls had to foul. The Cavs then curiously didn’t foul despite leading by three as LaVine made four dribbles. His shot bounced off the left side of the rim. “There were multiple options,” explained Dunn. “Lauri in the corner handoff or Zach coming off the stagger screen. Wanted to go look for Lauri. I did an in and up. Rodney Hood dipped that way; so I took it to the hole. They didn’t call nothing, so live with it. The Bulls got off to a good start this time, a 29-27 first quarter lead with Lopez scoring three straight early and then Selden late with back to back threes. Jabari Parker went back to barely playing, scoring eight points in 11 minutes on four of six shooting. Boylen took out the second unit group Parker was with three minutes into the fourth quarter after Cleveland opened the fourth with an 11-4 run. All five starters came back into the game. “I didn’t like the defense in that second group, so they all came out,” said Boylen. 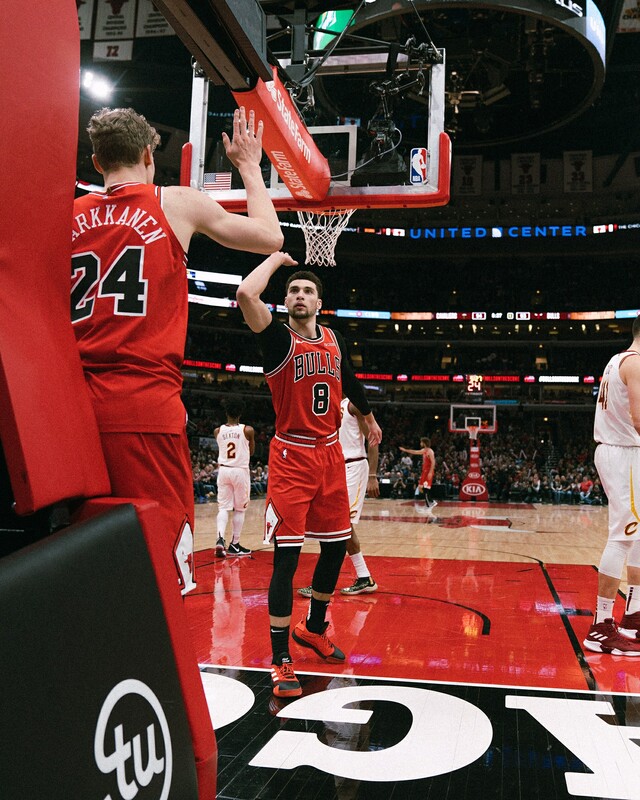 The Bulls led 53-51 at halftime and were tied at 79 through three quarters, but it was a mostly sluggish effort until those last nine minutes. 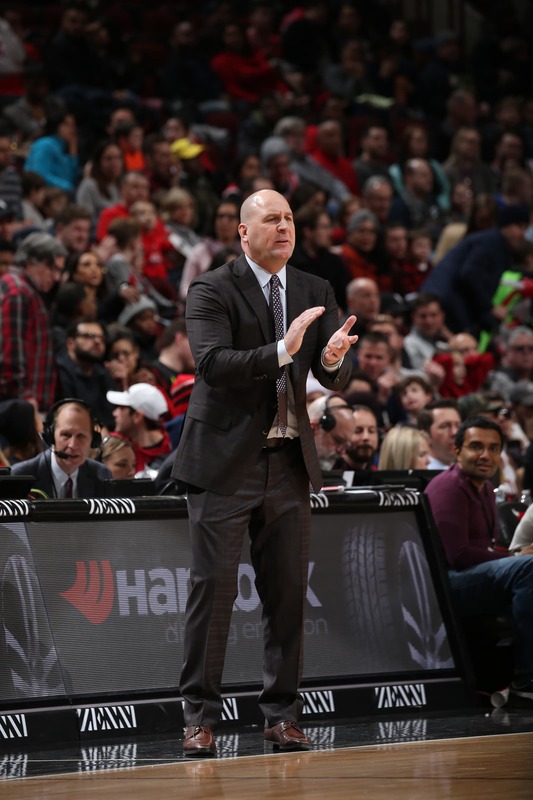 “Start of the third quarter I didn’t like our energy; we didn’t play with enough force,” said Boylen. But that starting group was more forceful and quickly got the Bulls back into the game as both Lopez and LaVine scored on the offensive boards. Markkanen tied the score at 94 with a three-point play after Dunn knocked the ball away from Collin Sexton and Selden fired to Markkanen running the left side. Markkanen is lethal on those outlets, few of which he gets. Markkenen took the hit on the run and Finnished, as we also like to say. The Bulls got a 98-96 lead with 3:52 left on Dunn and Lopez scores, Lopez with 16 points. The Cavs took back the lead in a game with 23 lead changes before Selden’s three, and then it came down to Dunn having to make that play.